Bowers Metrology has helped the Nuclear Advanced Manufacturing Research Centre achieve new levels of accuracy in precision engineered components for the energy industry. To help ensure the highest standards of quality at its research factory on the Advanced Manufacturing Park in South Yorkshire, the organisation has invested in state of the art measuring and testing equipment. Although, recently a particularly difficult measuring requirement confounded even the organisation’s most advanced equipment. Whilst the accurate measurement of external threads is a relatively simple gauging task, the measurement of internal threads has traditionally been regarded as an extremely problematic chore. When faced with the need to accurately measure a critical internal thread, in accordance with the Nuclear AMRC’s adoption of best practice, rather than use less precise and more time consuming methods, a search for a fast, accurate solution was undertaken. The problem was solved by the purchase of a Bowers XT Xtreme Bore Gauge that was supplied with internal thread measuring anvils. A welcome ‘bi-product’ of the impressive, extended travel capability of the advanced XT Xtreme Bore Gauges anvils is their unique ability to be adapted to accurately measure internal threads. 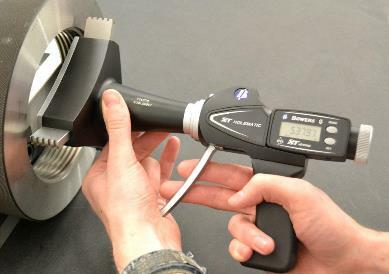 As XT measuring contacts are able to contract into the body of the gauge, prior to entry into a threaded bore, and then expand further than the anvils of previous generations of these popular digital gauges, Bowers is now able to provide global industry with a full range of extremely accurate internal thread measuring gauges. Rendering the use of the traditional, and often subjective, screw plug-gauges obsolete, Bowers is now capable of precisely machining the male profiles of all standard and even in-house created threads onto its hardwearing measuring anvils. When fitted to the company’s advanced XT Xtreme Digital Bore Gauges, users are now able to quickly achieve impressive accurate and repeatable internal thread measuring results. Ideal for companies’ inspection departments or even for use within hostile measuring environments, such as in close proximity to machine tools, Bowers’ cost-effective XT Xtreme Digital Gauges boast a very impressive IP65 rating, rendering them resistant to coolant, water and airborne particles. Available to measure thread sizes from 3mm up to 300mm, amongst a long list of useful features incorporated into these, radical tough instruments are: a large, clear digital display, metric/inch conversion and an RS 232 output. Simon Cavill, Metrology Engineer explained; “Bowers’ XT Xtreme Digital Gauges have proven ideal for our internal thread measuring needs. Not only are they extremely accurate and repeatable, they are also fast and easy to use. “The gauge is also ‘future proof’, as the need arises to measure different thread-forms and sizes, we will be able to purchase further measuring heads and fit them to our existing Bowers gauge. The Nuclear AMRC was founded in 2009 as part of the Government’s Low Carbon Industrial Strategy. It is led by the University of Sheffield with support from The University of Manchester, and Rolls-Royce as lead industrial partner. Other founding partners were Areva, Westinghouse, Sheffield Forgemasters and Tata Steel. Now, the collaboration of academic and industrial partners from across the nuclear manufacturing supply chain has a clear mission to enhance the capabilities and competitiveness of the UK civil nuclear manufacturing industry. The Nuclear AMRC aims to give manufacturers clarity and knowledge related to nuclear codes including ASME and RCC-M and quality standards, and help them meet and exceed the requirements. Members are provided with advice, support and information about customer requirements, to help them become preferred suppliers for the UK’s nuclear new build programme and to assist them in competing in the global market. For more information on Bowers' Special Bore Measurement solutions, click here.